Elmer J. Fudd/Egghead is a fictional cartoon character and one of the most famous Looney Tunes characters, and the de facto archenemy of Bugs Bunny. He has one of the more disputed origins in the Warner Bros. cartoon pantheon (second only to Bugs himself). His aim is to hunt Bugs, but he usually ends up seriously injuring himself and other antagonizing characters. He speaks in an unusual way, replacing his Rs and Ls with Ws, so "Watch the road, Rabbit," is replaced with "Watch the woad, wabbit!" 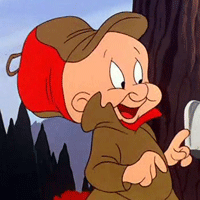 Elmer's signature catchphrase is, "Be vewy vewy quiet, I'm hunting wabbits", as well as his trademark laughter, "huh-uh-uh-uh-uh-uh-uh-uh". 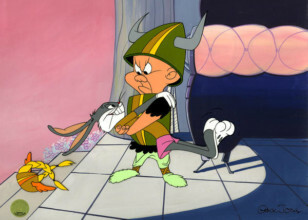 The best known Elmer Fudd cartoons include Chuck Jones' masterpiece What's Opera, Doc? 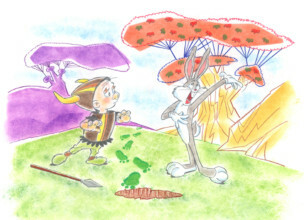 (one of the few times Fudd bested Bugs, though he felt bad about it), the Rossini parody Rabbit of Seville, and the "Hunting Trilogy" of "Rabbit Season/Duck Season" shorts (Rabbit Fire, Rabbit Seasoning, and Duck! Rabbit, Duck!) with Fudd himself, Bugs Bunny, and Daffy Duck.